Want to help your co-workers become more productive? Learn how your team can do twice the work in half the time in this book review of Scrum by Jeff Sutherland. Project managers have always struggled to help companies make more product, to complete projects on schedule, and to avoid employee burnout. It was a constant battle until the early 1990s. In 1993, Ken Schwaber and Jeff Sutherland developed a new way of managing projects. Their work with software developers paved the way for a faster, more reliable, and more effective way to create software. This tool can be used to help any company, not just software developers, become more productive. This project management tool, called Scrum, increases team output and productivity through accountability, interaction, and continual improvement. It is a framework that helps teams get organized and get more work done. Scrum uses visual tools to show team members the work that needs to be done and implements problem solving techniques to eliminate those things that prevent a team from getting the work done efficiently. Want to learn how you can implement Scrum in your organization? Jeff Sutherland, a co-creator of Scrum, takes you on a journey of learning in his book, Scrum: The Art of Doing Twice the Work in Half the Time (Crown Business, New York, 2014). This book doesn't tell you how to become more productive, it shows you. All through the book, you'll find examples of how teams used Scrum to overcome obstacles, find their strengths, and create a harmonious workplace. You'll see how organizations went from failure to success by implementing Scrum. You'll get a peak inside the problems these organizations faced, see what strategies worked, and find out what strategies didn't work. Sutherland doesn't hold back and takes every opportunity to show how Scrum can work in a variety of industries. The writing style. This book is easy to read and easy to understand. Sutherland uses plain writing to deliver his message in a way that is effortless to comprehend. The chapter takeaways. Each chapter ends with a summary of the important points covered in that chapter. These takeaways not only provide an excellent recap, but also provide a checklist that can be referenced later when you need a refresher. The problem-solving approach. Sutherland shows how problems can be overcome by implementing Scrum. He tells how companies have rejected Scrum, only to come back later to try Scrum with success. A manager searching for new ideas to increase the amount of work your teams output and for productive ways to improve employee morale. An employee wishing to be a valuable asset within your organization and to advance within your profession. An independent contractor desiring to increase the efficiency of your client's projects and to gain an advantage within your industry. An individual looking for ways to remove the distractions that keep you from getting your work done and from having more fun time to spend with family. I give this book 5 stars because it is full of ideas that will help individuals, small businesses, and large organizations become more productive. After 230 pages of easy reading, I saw an increase in my ability to get more work done. I found new ways to get rid of distractions and better ways to organize my workload. If you manage a team of people, need to increase their productivity, and want to give them more playtime, get a copy of Scrum. By practicing the sound project management techniques in this book, your team will be getting more work done in the office and having more fun at home. DISCLAIMER: I received a copy of Scrum: The Art of Doing Twice the Work in Half the Time by Jeff Sutherland (Crown Business, 2014) from Blogging For Books in exchange for this review. My opinions are my own. Sounds like an excellent strategy for working more effectively both as part of a team in the workplace and as an individual working from home. I will be checking this book out as I know I'd benefit from learning how to remove distractions from my working time. Excellent review, Coletta. Nice that the book provides solutions for individuals as well as for teams. I love the promise in the title. Definitely will check this out! Who wouldn't want to get twice work done in half the time?!! This excellent book review makes me want to jump right in, starting reading and start being more productive myself. Sounds like a great book...thanks for the recommendation. 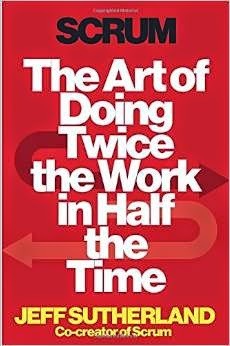 I'll remember this one, sounds like a good book for a team to read and implement - efficiency equals dollars saved - great review!